Department of psychiatry, Medical University - Varna, Bulgaria; Third psychiatric Clinic, University hospital "St. Marina" - Varna, Bulgaria. The achievements of the contemporary psychopharmacology enable the out-patient treatment of schizophrenic patients, thus let them living in their usual social environment- family, relatives, neighbors, friends. In this connection, the real conditions of patients’ micro-social environment play an important role- either stimulating their compensatory mechanisms, or exercising negative impact on their adaptation and behavior. We examined 30 schizophrenic patients (22 males, 8 females), who have committed aggressive acts, triggered by psycho-traumatic situations with different sensible content, originating from their micro-social environment. Dominant were family conflicts, followed by conflicts with the neighbors. The aggressive acts were directed to concrete persons, from the close neighborhood, involved into the psycho-traumatic situations. Studying and evaluation of the aggressive acts, triggered by psycho-traumatic factors play an important role for their prevention. Key words: violence, aggression, schizophrenia, psycho-traumatic factors. Please cite this article as: Todorov St, Arnaoudova M. SOME ASPECTS OF THE AGGRESSIVE ACTS, COMMITTED BY SCHIZOPHRENIC PATIENTS, TRIGGERED BY SOME PSYCHO-TRAUMATIC FACTORS. J of IMAB. 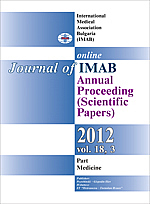 2012; 18(3):337-338. doi: 10.5272/jimab.2012183.337. 1. Harris GT, Rice ME, Quinsey VL. Violent recidivism of mentally disordered offenders: the development of a statistical prediction instrument. Criminal Justice and Behavior. 1993; 20:315 -335. 10. Volavka J, Laska E, Baker S, Meisner M, Czobor P, Krivelevich I. History of violent behaviour and schizophrenia in different cultures. Analyses based on the WHO study on Determinants of Outcome of Severe Mental Disorders. Br J Psychiatry 1997 Jul;171:9-14. [PubMed].